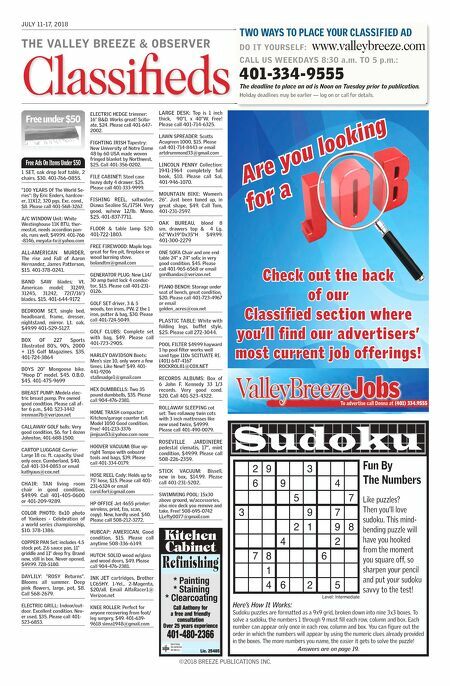 Classifi eds THE VALLEY BREEZE & OBSERVER JULY 11-17, 2018 DO IT YOURSELF: www.valleybreeze.com TWO WAYS TO PLACE YOUR CLASSIFIED AD CALL US WEEKDAYS 8:30 a.m. TO 5 p.m.: The deadline to place an ad is Noon on Tuesday prior to publication. Holiday deadlines may be earlier — log on or call for details. 401-334-9555 Free Ads On Items Under $50 1 SET, oak drop leaf table, 2 chairs. $30. 401-766-0855. "100 YEARS Of The World Se- ries": By Eric Enders, hardcov- er, 11X12, 320 pgs. Exc. cond., $8. Please call 401-568-3267. A/C WINDOW Unit: White Westinghouse 11K BTU, ther- mostat, needs accordion pan- els, runs well, $49.99. 401-766 -8146, meyata-tv@yahoo.com ALL-AMERICAN MURDER, The rise and Fall of Aaron Hernandez, James Patterson, $15. 401-378-0241. BAND SAW blades; Vt. American model; 31249, 31245, 31242, 72(7/16") blades. $15. 401-644-9172 BEDROOM SET, single bed, headboard, frame, dresser, nightstand, mirror. Lt. oak. $49.99 401-529-5127. BOX OF 227 Sports Illustrated 80's, 90's, 2000 + 115 Golf Magazines. $35. 401-724-3864 BOYS 20" Mongoose bike. "Hoop D" model. $45. O.B.O. $45. 401-475-9699 BREAST PUMP: Medela elec- tric breast pump. Pre owned good condition. Please call af- ter 6 p.m., $40. 523-1442 irenman76@verizon.net CALLAWAY GOLF balls: Very good condition, $6. for 1 dozen Johnston, 401-688-1500. CARTOP LUGGAGE Carrier: Large 18 cu. ft. capacity. Used only once. Cumberland, $40. Call 401-334-0853 or email kathyaus@cox.net CHAIR: TAN living room chair in good condition, $49.99. Call 401-405-0600 or 401-209-9289. COLOR PH0TO: 8x10 photo of Yankees - Celebration of a world series championship, $10. 378-1386. COPPER PAN Set: includes 4.5 stock pot, 2.6 sauce pan, 11" griddle and 11" deep fry. Brand new, still in box. Never opened, $49.99. 728-5180. DAYLILY: "ROSY Returns". Blooms all summer. Deep pink flowers, large. pot, $8. Call 568-2679. ELECTRIC GRILL: Indoor/out- door. Excellent condition. Nev- er used, $35. Please call 401- 523-6853. ELECTRIC HEDGE trimmer: 16" B&D. Works great! Scitu- ate, $24. Please call 401-647- 2002. FIGHTING IRISH Tapestry: New University of Notre Dame 48 by 60 USA made woven fringed blanket by Northwest, $25. Call 401-356-0202. FILE CABINET: Steel case heavy duty 4 drawer. $25. Please call 401-333-9999. FISHING REEL, saltwater, Diawa Sealine SL/175H. Very good, w/new 12/lb. Mono. $25. 401-837-7711. FLOOR & table lamp $20. 401-722-1803. FREE FIREWOOD: Maple logs great for fire pit, fireplace or wood burning stove. bolandtm@gmail.com GENERATOR PLUG: New L14/ 30 amp twist lock 4 conduc- tor, $15. Please call 401-231- 0126. GOLF SET driver, 3 & 5 woods, ten irons, PW, 2 the 1 iron, putter & bag, $30. Please call 401-724-5049. GOLF CLUBS: Complete set with bag, $49. Please call 401-723-2905. HARLEY DAVIDSON Boots: Men's size 10, only worn a few times. Like New!! $49. 401- 441-9206 stallmadge1@gmail.com HEX DUMBBELLS: Two 35 pound dumbbells, $35. Please call 904-476-2381. HOME TRASH compactor: Kitchen/garage counter tall. Model 1050 Good condition. Free! 401-233-3376 jimjoan53@yahoo.com none HOOVER VACUUM: Blue up- right Tempo with onboard tools and bags, $39. Please call 401-334-0179. HOSE REEL Cady: Holds up to 75' hose, $15. Please call 401- 231-6324 or email carol.forl@gmail.com HP OFFICE Jet 4655 printer: wireless, print, fax, scan, copy). New, hardly used. $40. Please call 508-212-3272. HUBCAP: AMERICAN. Good condition, $15. 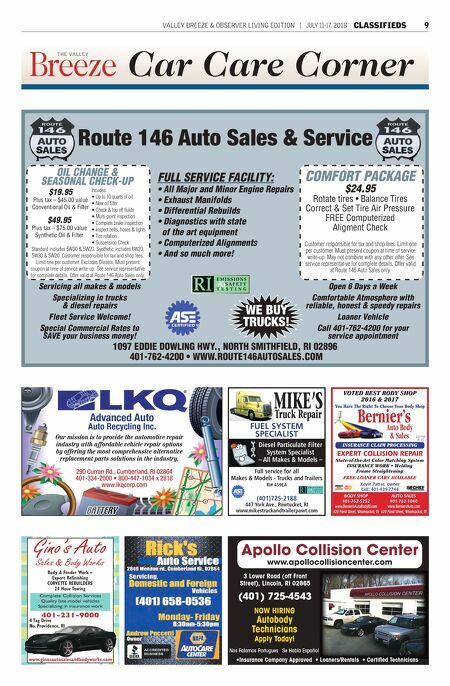 Please call anytime 508-336-6149. HUTCH: SOLID wood w/glass and wood doors, $49. Please call 904-476-2381. INK JET cartridges, Brother LC65HY. 1-Yel., 2-Magenta, $20/all. Email AlfaRacer1@ Verizon.net KNEE ROLLER: Perfect for anyone recovering from foot/ leg surgery, $49. 401-639- 9618 slena1948@gmail.com LARGE DESK: Top is 1 inch thick, 90"L x 40"W. Free! Please call 401-714-6325. LAWN SPREADER: Scotts Acugreen 1000, $15. Please call 401-714-8443 or email artdrummond33@gmail.com LINCOLN PENNY Collection: 1941-1964 completely full book, $10. Please call Sal, 401-946-1070. MOUNTAIN BIKE: Women's 26". Just been tuned up, in great shape, $49. Call Tom, 401-231-2597. OAK BUREAU, blond 8 sm. drawers top & 4 Lg. 62"Wx19"Dx35"H $49.99. 401-300-2279 ONE SOFA Chair and one end table 24" x 24" sofa: in very good condition, $45. Please call 401-965-6568 or email gordhandas@verizon.net PIANO BENCH: Storage under seat of bench, great condition, $20. Please call 401-723-4967 or email golden_acres@cox.net PLASTIC TABLE: White with folding legs, buffet style, $25. Please call 272-3044. POOL FILTER $49.99 hayward 1 hp pool filter works well sand type 110v SCITUATE RI. (401) 647-4167 ROCKROL81@COX.NET RECORDS ALBUMS: Box of 6 John F. Kennedy 33 1/3 records. Very good cond. $20. Call 401-523-4322. ROLLAWAY SLEEPING cot set: Two rollaway twin cots with 3 inch mattresses like new used twice, $49.99. Please call 401-490-0079. ROSEVILLE JARDINIERE pedestal clematis, 17", mint condition, $49.99. Please call 508-226-2359. STICK VACUUM: Bissell, new in box, $14.99. Please call 401-231-5202. SWIMMING POOL: 15x30 above ground, w/accessories, also nice deck you remove and take. Free! 508-695-0742 LLefty0077@gmail.com ©2018 BREEZE PUBLICATIONS INC. Sudoku Fun By The Numbers Like puzzles? Then you'll love sudoku. This mind- bending puzzle will have you hooked from the moment you square off, so sharpen your pencil and put your sudoku savvy to the test! Here's How It Works: Sudoku puzzles are formatted as a 9x9 grid, broken down into nine 3x3 boxes. To solve a sudoku, the numbers 1 through 9 must fi ll each row, column and box. Each number can appear only once in each row, column and box. You can fi gure out the order in which the numbers will appear by using the numeric clues already provided in the boxes. The more numbers you name, the easier it gets to solve the puzzle! Answers are on page 8. Answers are on page 19. * Painting * Staining * Clearcoating Call Anthony for a free and friendly consultation Over 25 years experience 401-480-2366 Lic. 25485 Refinishing Refinishing Kitchen Cabinet Are you looking Are you looking for a for a Check out the back Check out the back of our of our Classified section where Classified section where you'll find our advertisers' you'll find our advertisers' most current job offerings! most current job offerings!